Want to look and feel younger? 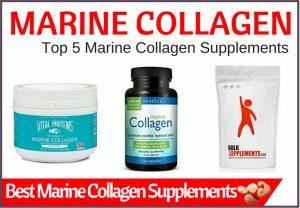 Well the best marine collagen supplements may just be your answer! Collagen is a fibrous protein responsible for healthy skin, hair, bones, joints and cartilage. As we age, our bodies produce less and less of this essential component and this is the reason we begin to experience wrinkles, limited mobility and joint pain. There are a handful of lifestyle changes we can make to slow the demise of collagen in our bodies. This includes avoiding excessive sunlight, sugar and smoking to name a few. However despite these changes, eventually our bodies will come to a point where they will struggle to create collagen at a pace at which we could do with it. So if lifestyle changes can only help us so much, what else can we do? This is where supplements come in. 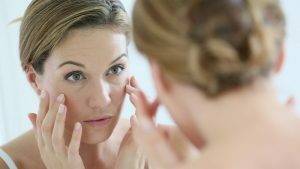 Millions of people try to fight the aging process every year and there is a market specifically for it. Collagen supplements are one aspect of that market that tends to be less known or explored. However if your body is no longer producing enough, isn’t the logical conclusion to feed it some instead? Some of the best collagen supplements on the market come from various different sources. One of the most popular is marine. Marine Collagen is collagen that comes from marine life. The most popular form is fish collagen which is usually taken from skin, bones, scales and fins of fresh or saltwater fish to make supplements. 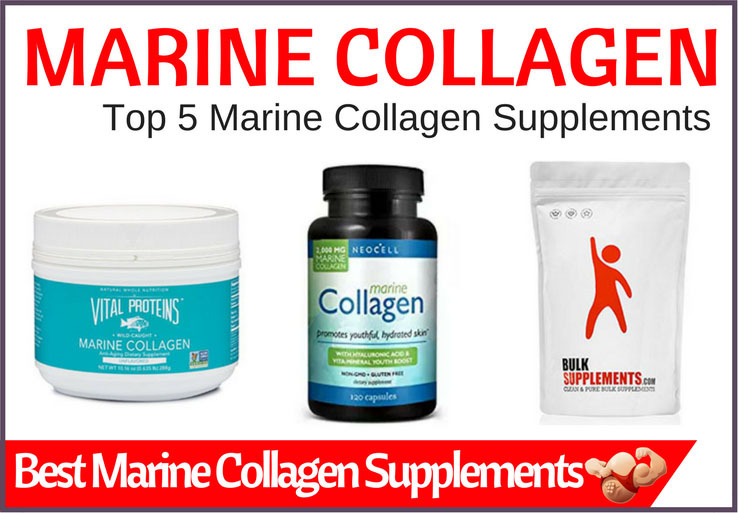 However marine collagen supplements can sometimes be sourced from shellfish and jellyfish. Marine collagen is the closest in resemblance to human collagen. Type 1 collagen is abundant in fish and is the most absorbable form of collagen. Type 1 is believed to be the most effective and strongest form. It also contains glycine and proline. Fish collagen is known for its support for skin, bones and vital organs. Fish collagen is made up of type 1 collagen which is what our skin is made up of. Therefore it isn’t really surprising that it benefits the skin. The benefits include smoother skin, reduced wrinkly visibility and helps retain the elasticity of the skin. 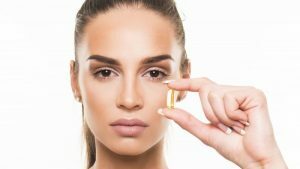 Research published in Open Nutraceuticals Journal shows how trials have shown that it does indeed improve and benefit the skin in a number of ways including, reduction of wrinkles, hydration and elasticity. It also helps increase the body’s own natural collagen production (which is what you want to do for smooth skin) and can help wounds heal faster. Collagen plays a critical role in all phases of wound healing too. Fish collagen has also been shown to fight staph infections with its antibacterial peptide property collagencin. Vital Proteins is a brand that provides sustainably sourced nutrition product. Their products are of very high quality and this is reflected in their brand ethos. It is Snapper scale collagen which comes from non GMO Project verified snapper that is wild caught in the Pacific Ocean near Hawaii. It does not come in tablet form but a powder which can be sprinkled over your food or added to smoothies. It has no taste so should not taint the food you put it on or give it a “distinct flavor”. There are also no filler ingredients – it is just marine collagen and thus pure. The recommended daily dose is 2 scoops per day. The container therefore gives you 24 days worth of supply. The powder dissolves very well both in hot and cold liquids. It has the ability to make a huge difference to your health and you can see this by reading the reviews. Many consumers have commented on improved skin (including less acne), better digestion as well as joint and muscle aches and pains improving. 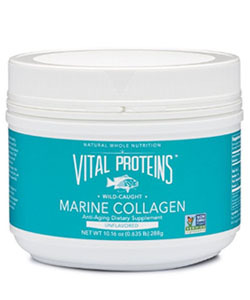 The Vita Proteins Marine Collagen is on the pricier side compared to other products, but due to its quality is worth the investment. 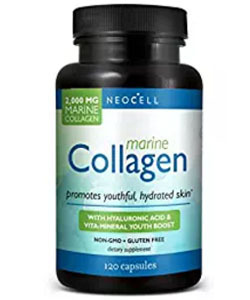 Neocell’s Marine Collagen plus Hyaluronic acid is a great supplement for many reasons. Firstly the fish collagen (tilapia) within this supplement is hydrol yzed into peptides to give maximum biolvailability. Fish collagen is already easily digestible but this gives an additional support to that. Neocell also comes with Hyaluronic Acid. Hyaluronic acid is an essential lubricant of healthy skin, eyes and joints. Just like collagen, Hyaluronic Acid also slows in production with age and thus the skin becomes more dehydrated and less elastic. Hyaluronic acid is therefore a great additional component to have alongside collagen for better looking skin and health. Neocell’s marine collegen+HA is designed for those looking to thicken their hair or slow hair loss. It is also perfect for correcting weak, split nails and is great for joints, tendons and ligaments. Consumers of this product do state that they have experienced smoother skin and thicker fuller hair from using it. Some have stated some side effects from using it too but still rate the product despite these. Neocell comes in capsule form (fish gelatine capsules) and is also relatively cheap in comparison to other brands, so worth looking into if you are on a budget. 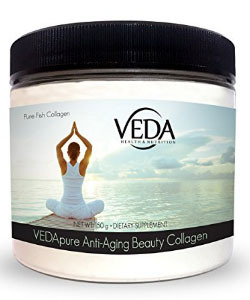 VEDApure collagen is a pure product with only 100% collagen as its ingredients. It is in powder form that is tasteless and can be mixed into a smoothie or a hot drink depending on what you prefer. VEDApure’s collegen is made from fish scales only and not skin. This, apparently, makes it easier to mix into your drink and also makes it tasteless. The serving size for VEDApure is 1 heaped tablespoon and the tub contains 30 servings. VEDApure is well priced too. It is much cheaper than other pure powders for the same effect. The reviews are also pretty positive for this powder too. Many customers have commented they have experienced stronger nails and thicker hair as a result of using it. Others have commented on their skin being much smoother too. 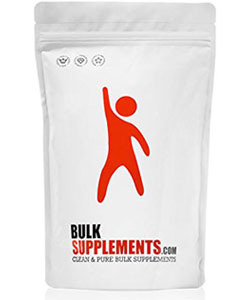 Bulk Supplements tend to be a brand we recommend a lot because they have a great range of pure products made from quality ingredients. Their fish collagen is no different. There are no fillers or additives just hydrolyzed fish collagen from fish skin and scales. This pouch has 100 servings at a competitive price – i.e. it isn’t expensive and in fact works out cheaper than other options presented here. Bulk Supplements Hydrolyzed fish collagen also has great reviews with plenty of customers experiencing smoother skin, fuller hair and less aches. Aspen is another good brand and this peptide powder is 100% pure with no fillers or additional unnecessary ingredients. 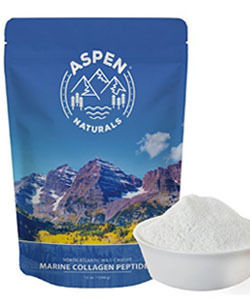 Aspen’s marine collagen is produced from the skin of wild-caught deep sea cod making it one of the best fish collagen supplements available.. The cod is sutainbly and responsibly harvested from the North Atlantic ocean. This also means that the cod will not contain any growth hormones or antibiotics, which is potentially a problem with farmed fish. Aspen’s also has a whole host of marine collagen reviews that are positive and praising of the product. When buying any supplement it is important to factor in a few things before you decide on which product to choose. In the case of finding the best we have listed a few things for you to consider yourself when choosing a quality supplement. Vitamin C, hyaluronic acid, co-enzyme Q10 and chondroitin sulfate are all ingredients that help with collagen's absorbability. So if you find a supplement with these in they will help maximize the benefits. Quality – The source of collagen is also another thing to consider as this will certainly affect the quality of collagen you are receiving. 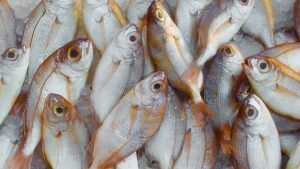 Farmed fish versus wild caught is one factor but you also have to weight up the pros and cons of whether the fish are coming from polluted waters. A concern for quality is also a concern for sustainability and ethics. So if you want a product that is ethically sourced, where the collagen is coming from is definitely an important consideration. If you can’t find the information readily available, you can contact the brand in question to get them to disclose the information before pulling the trigger on a purchase. Price – If you are on a budget then price will matter. Some products may also be overpriced for what they give. Generally though, it is fairly cheap so it shouldn’t be a problem getting a good quality supplement for a low price. 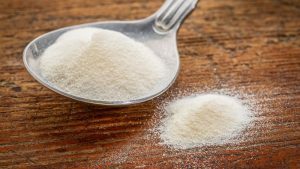 Taking Your Supplement - If you opt for a pure 100% collagen powder it is worth taking it with Vitamin C (ideally a natural source as opposed to absorbic acid) to help maximize absorbency. Marine collagen can be a great supplement to take if you are concerned by the health of your skin and hair, in particular. It is easy on the digestion and provides a whole host of benefits. We hope our list has provided you with enough information in order to make a decision of what you would like to try.